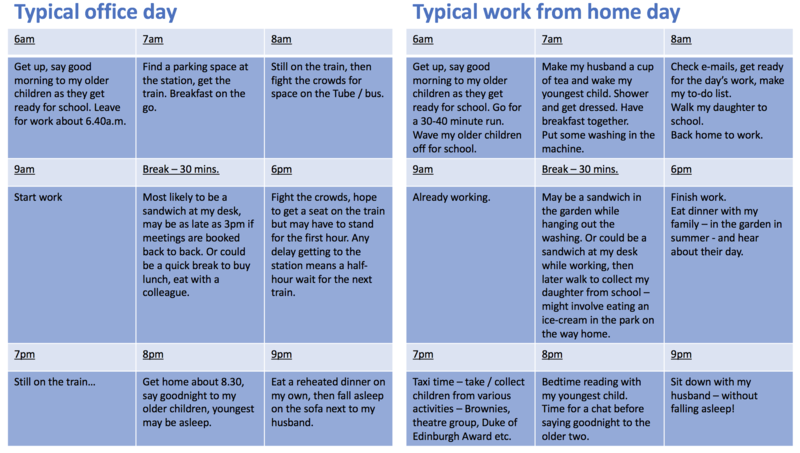 When I hear people describing working from home as ‘shirking from home’, I shudder at how that attitude can create or perpetuate doubt in the minds of any employer who is yet to consider any form of flexible or remote working, or as Barclays calls it, ‘dynamic working’. Let’s be honest, any alteration to a typical working pattern or location requires self-discipline, drive and a motivation to work that way. Those who know they shirk rather than work have yet to instill their own discipline and if they don’t, know their performance and delivery is adversely affected. It also doesn’t work for everyone – some people prefer to get away to work, to have a clear and consistent routine, or their job may simply not allow for the flexibility in location. Work-life balance and personal health have become increasingly important to me, not least as my children get older and with the dawning realisation they won’t always be at home waiting for me to get back from work at night, or to at least give them a call from another country before they go to bed. Taking part in the Global Corporate Challenge also made me realise how little exercise I take in an office-based working week. Let me put a bit of context around my work – typically, if I’m working for an organisation, my work is international or covers multiple locations. So wherever Head Office or the main work location is, not all of my clients are there and I contact those who aren’t by phone, e-mail, etc. My work may involve travel to other sites or countries, so my working hours are often not standard – up at 4am to catch an early flight, away for a few days or a week, or possibly home the same night. The difference in the quality of my day is clear. Look for where there is a chance to exercise and get out into the sun or rain. Vitamin D is important for health too, and sunshine gives you that. Time spent on trains and in an air-conditioned office does not. The quality of my work and delivery is definitely impacted – impacted positively by the lack of commute, the addition of exercise and time to think. I mentioned needing self-discipline to be effective at working remotely. In my case, as with many other people, this discipline also extends to my family, so my children have learnt not to come running in noisily in case I am on the phone, not to come in if the door is closed when they get home from school, that I will come and say hello to them when I next break to make a cup of tea. Or now they are older, they quietly bring me a cup of tea and a quick hug. I don’t get that in an office! As little as one day a week like this keeps me more connected with my family and more refreshed for the days I do travel to a different location to work. Have you tried it? How does it work for you? Oh, and the honest truth – I might only run for 25 minutes on some days…! Wan to know more about this topic and others? Click here.